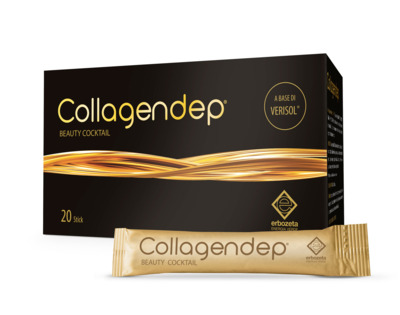 COLLAGENDEP® is a food supplement based on VERISOL® (collagen peptides), Hyaluronic acid, Resveratrol, Vitamins and Mineral salts. Vitamin C contributes to the formation of collagen for the normal function of the skin. Zinc contributes to the maintenance of normal skin. Copper and Zinc contribute to protect the cells from oxidative stress. VERISOL® is a trademark of GELITA AG in Germany and other countries. VERISOL® [hydrolyzed collagen peptides], Vitamin C, Sodium hyaluronate, Zinc, Polygonum, Copper, Biotin.